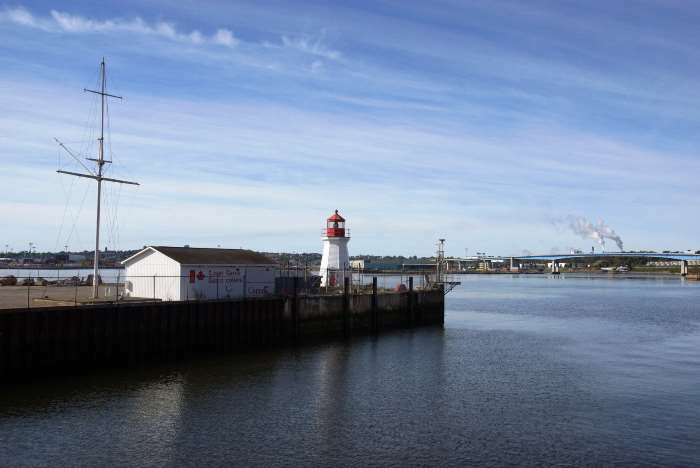 Just an hour’s drive north of the US/Canadian border, you’ll find a beautiful city on the banks of the Saint John River. 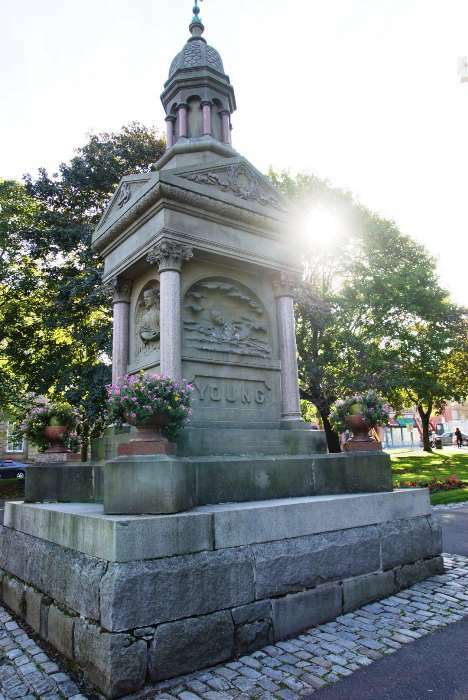 Appropriately enough, it’s the city of Saint John — and it has a beautiful downtown that’s worth exploring, even if you’re just passing through. 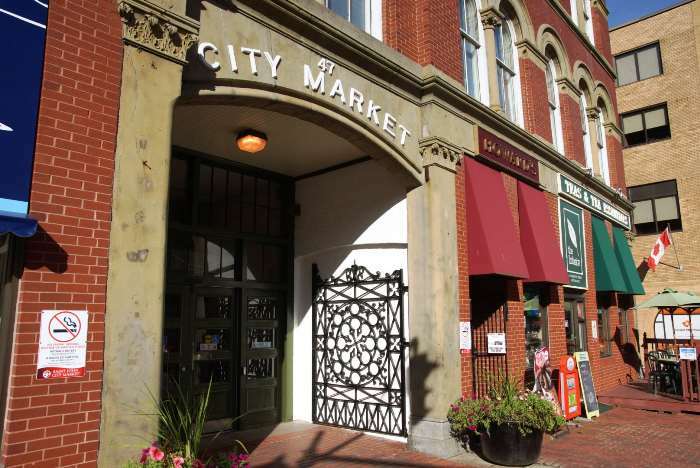 And if nothing else, you’ll really want to take a walk through its historic market, the oldest continuously-operated farmer’s market in Canada. Saint John is located along New Brunswick Route 1, near the junction with Route 7. It’s about 70 miles, or 115 kilometers, from the U.S. border at Calais, Maine, and about 15o kilometers from Moncton, New Brunswick, the next big city up the road. 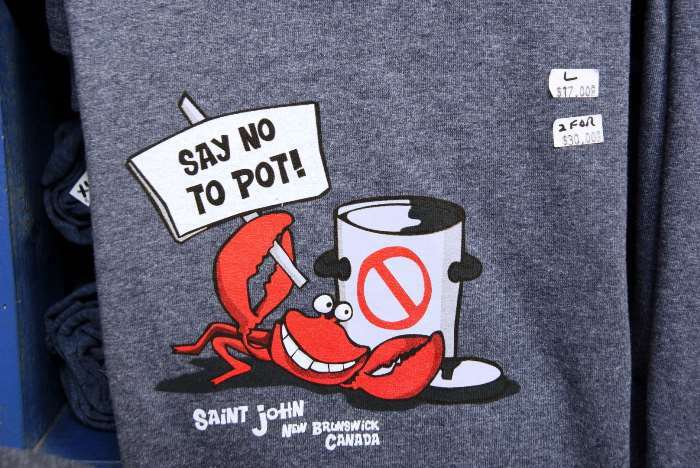 As I drove into Saint John from the west, I wasn’t sure I was going to like this city. The western side of Saint John is industrial, and some smokestacks make the city look gritty. But then, you cross the Saint John River on Route 1, and everything changes. 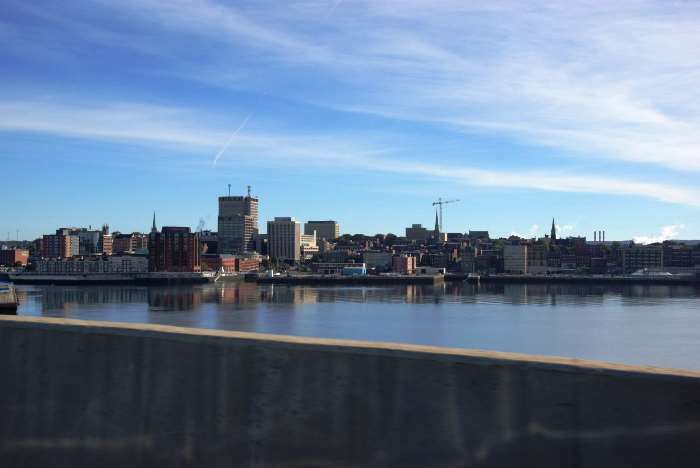 I snapped this picture of downtown Saint John while driving across the bridge – then I took the exit into town, for a look around. 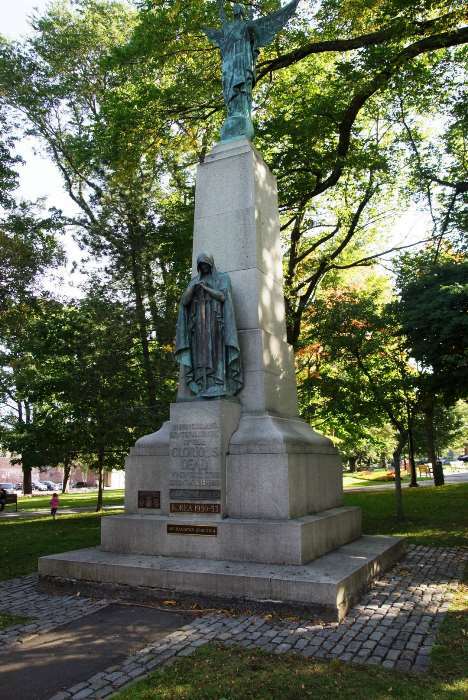 … and some other monuments that honor the area’s history and war veterans. The park is a nice gathering place for city folk, and if I had arrived just a week or two later, I’m sure it would have been very colorful with autumn leaves. 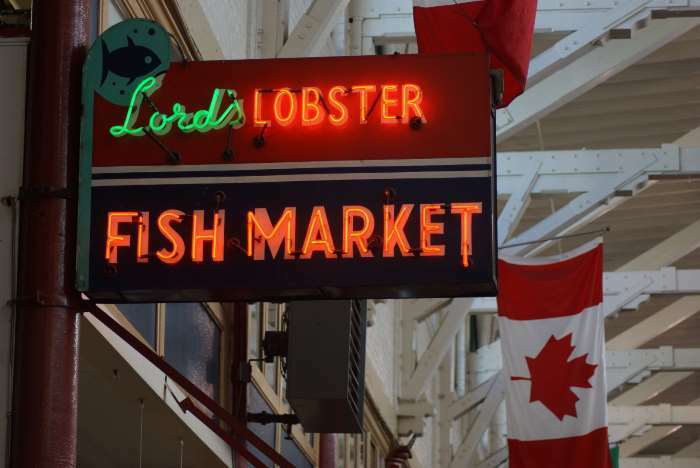 … and fresh fish and lobster. 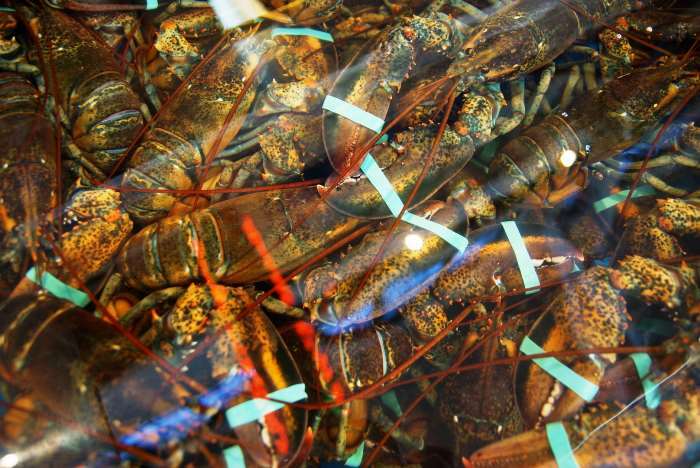 The lobster tanks were huge, and packed to the top with crustaceans destined for a melted butter bath. … before eventually emerging near the waterfront. Here, you’ll get a nice view of some of Saint John’s buildings. They aren’t exactly skyscrapers, but I think that’s what makes Saint John so nice. It’s just big enough. … including these, um, people. 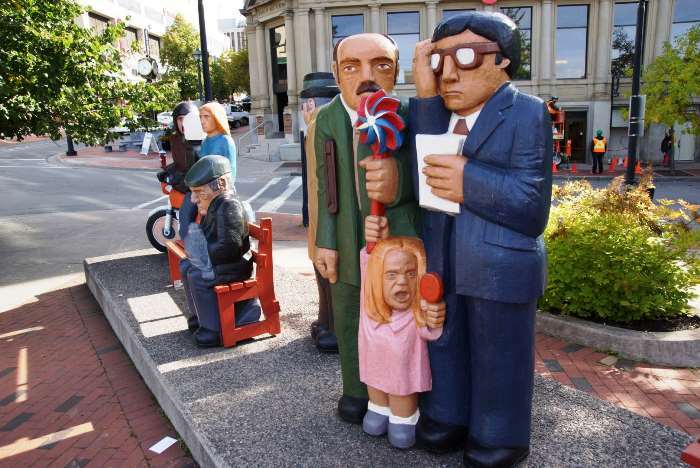 This sculpture is called “People Waiting”, and it was created by John Hooper, an English-born Canadian sculptor with works on display across Canada and worldwide. The tower pictured above is another Hooper creation, called “Time Piece”, which features numerous other blocky people. 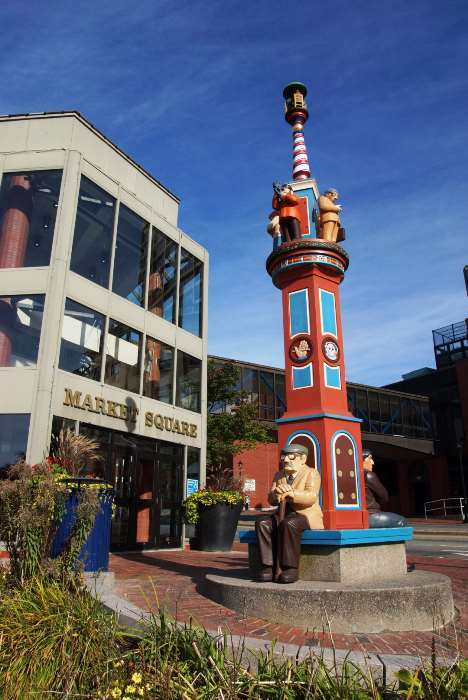 Keep walking past the artwork, and you’ll reach Saint John’s waterfront — marked with a tiny lighthouse. 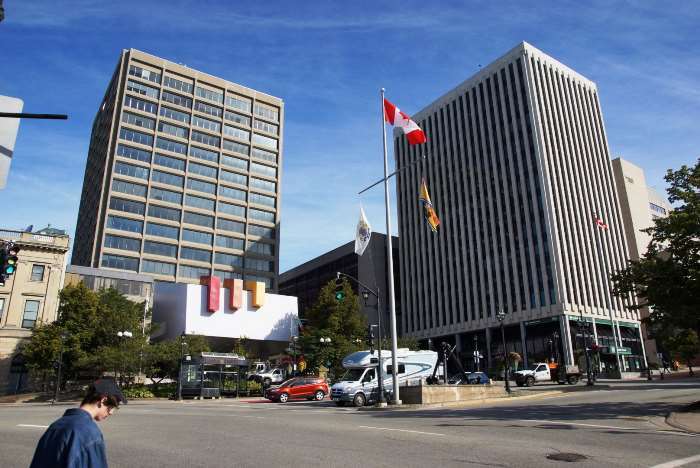 There’s also a Hilton hotel, a few nice restaurants, and the New Brunswick Museum, all nearby. 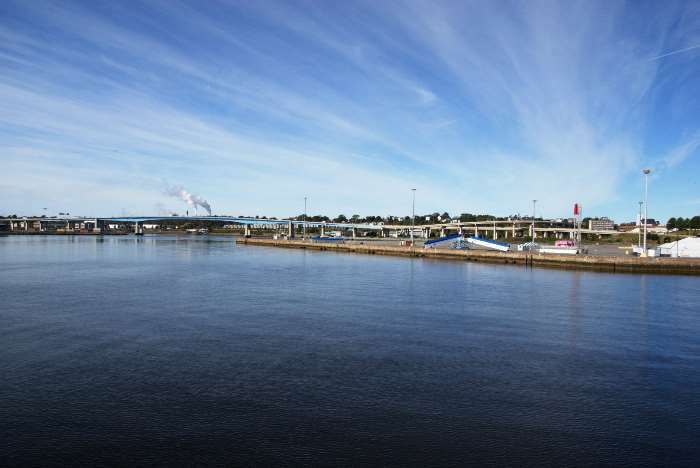 If you look across the mouth of the Saint John River, you can see the industrial western-end of town. From this angle, it doesn’t look so bad! 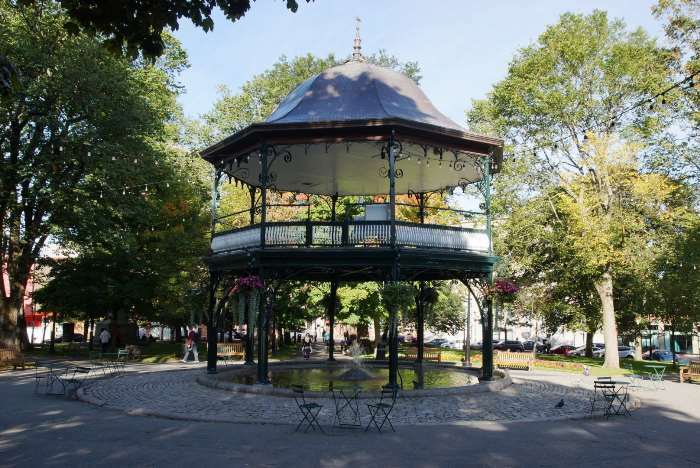 There’s more to explore in Saint John. Keep reading on the next page, as I hopped into the car and headed up to the city’s big hillside sign. 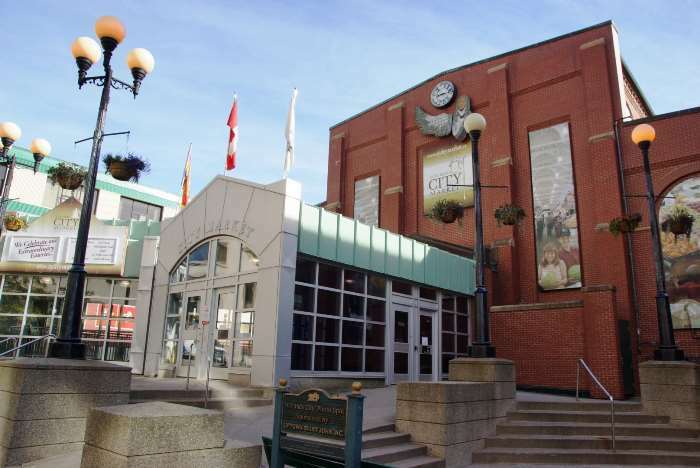 Even if you’re just passing through the area, find some time to explore Saint John. 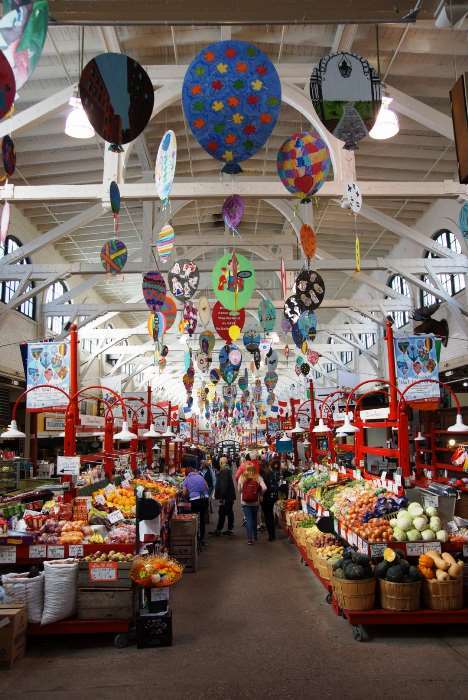 Take a walk through the City Market and check out the waterfront.